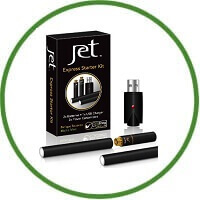 Jet Cigs primarily seeks to be a premier provider of flavoured cartomizers. Actually, it is a leading provider of the highest quality, 100% made in the USA, pre filled cartomizers to the electronic cigarette industry. They have the widest assortment of flavours that are fully compatible with some of the most popular e-cig brands. In addition to these eleven e-juice blends, JetCigs has developed its own e-cig starter kit, as well as a disposable device offering people an inexpensive way to try their cartomizers. Corporate Headquarters: Manufacturing and order fulfilment facility is located in the Greater Philadelphia area. Marketing team is based out of South Florida. The JetCigs Express Kit costs even cheaper. You can get an additional 20% OFF your entire order by using our coupon code! Jet batteries are logo-free, with a satin black finish and white LED. The battery contains the pressure sensor, microcontroller, and lithium-ion battery which power the device. The batteries will never turn on unless you’re puffing on them. Jet Cigs cartomizers have an 8.5mm diameter and are 510-threaded. They have a resistance of 2.8 ohms and are designed to be used with batteries using anywhere between 3.3 to 4.2 volts. These cartomizers are compatible with all “super mini” or “micro” 8.5mm diameter batteries with a 510-thread (Blu, Vulcano, etc.) It is available in 11 different flavours. JetCigs starter kits are covered under a 1 year limited warranty..
None of the statements made on www.ecigarettereviewstruth.com have been reviewed by the Food and Drug Administration (FDA). The advices and products mentioned on www.ecigarettereviewstruth.com are not intended to diagnose, treat or prevent any diseases. You should consult with your doctor before using any product mentioned on www.ecigarettereviewstruth.com. We may receive commission or other income on certain products. However, this does not impact our reviews and comparisons mentioned on www.ecigarettereviewstruth.com. We try our best to keep things fair and balanced, in order to help you make the best choice for you. Any and all trademarks, logos, brand names and service marks displayed on www.ecigarettereviewstruth.com are the registered or unregistered trademarks of their respective owners.